The young heroine in Sinners and the Sea is destined for greatness. Known only as “wife” in the Bible and cursed with a birthmark that many think is the brand of a demon, this unnamed woman—fated to become the mother of all generations after the great flood—lives anew through Rebecca Kanner. The author gives this virtuous woman the perfect voice to make one of the Old Testament’s stories come alive like never before. Desperate to keep her safe, the woman’s father gives her to the righteous Noah, who weds her and takes her to the town of Sorum, a haven for outcasts. Alone in her new life, Noah’s wife gives him three sons. But living in this wicked and perverse town with an aloof husband who speaks more to God than to her takes its toll. Noah’s wife struggles to know her own identity and value. She tries to make friends with the violent and dissolute people of Sorum while raising a brood that, despite its pious upbringing, develops some sinful tendencies of its own. While Noah carries out the Lord’s commands, she tries to hide her mark and her shame as she weathers the scorn and taunts of the townspeople. But these trials are nothing compared to what awaits her after God tells her husband that a flood is coming—and that Noah and his family must build an ark so that they alone can repopulate the world. As the floodwaters draw near, she grows in courage and honor, and when the water finally recedes, she emerges whole, displaying once and for all the indomitable strength of women. Drawing on the biblical narrative and Jewish mythology, Sinners and the Sea is a beautifully written account of the antediluvian world told in cinematic detail. 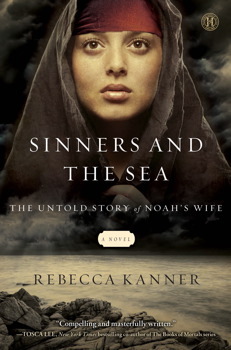 Rebecca Kanner’s new debut novel, Sinners and the Sea, is a dark tale about the world as Noah and his family prepares to sail away on the arc. The author uses her vivid imagination to create and enhance this tragic story. Told through the eyes of Noah’s wife, a nameless, birth-marked young woman, she gives us a glimpse of a world rife with sin, crime, treachery, and lust. The protagonist spends the entire book wishing for a name, waiting for Noah to choose one for her. Like the bible, God has spoken to Noah and directed him to build an arc and to collect breeding animals to sail away with and start a new life when the floods come to drown the sinful world and its sinners. But even amongst his own family, there is evil afoot – Japheth being a violent son and Ham being the good son. The third son is very young in the story. The novel follows the trials and tribulations faced in the building of the arc with villagers stealing the building materials while Noah’s wife must keep everyone from discovering her birthmark for fear they will kill her. The author delves into the primitive brutality of the era and their desperation to cling to life when the floods begin to arrive. It places Noah and his family in constant peril when they cannot help. I enjoyed reading about castaways floating on debris or small boats during the deluge who will soon be drowned. As in the bible, Noah is described as being hundreds of years old, but his role in the book is not a likable one. He is a harsh, demanding character, demonstrating little emotion. I found this added conflict and made the story more interesting. Not your normal run-of-the mill novel, this book is well written, and takes a very unconventional approach to a well-known story. The story is compelling because it has an edge to it that leaves the reader disconcerted and therefore interested in reading onwards. The best word to describe it is haunting. A fascinating look into an feral civilization of turmoil and hardship.